Since 1934, North Shore Vacuum and Appliance has provided the largest assortment of vacuum cleaners Salem MA area residents could choose from. We sell and repair virtually all brands of vacuum cleaners, and pride ourselves on offering something for everyone. We offer a full line of residential and commercial vacuum cleaners to suit the needs of Salem MA area homes and businesses. In addition to vacuum cleaners, customers can find everything from industrial and residential supplies, to accessories, hoses, motors and hard-to-find parts inside our shop. To talk to us today about ordering spare parts or other appliances other than vacuum cleaners, call our shop at (781) 595-1455. Most Vacuum Cleaners Ship Free! Residents and businesses throughout greater Salem MA have the opportunity for free shipping when they order $59 or more in materials. 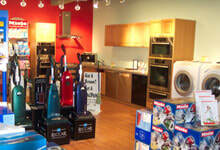 So for the best discounts on quality vacuum cleaners, Salem MA area residents should stop by today.